We create customized treatment plans to help improve the quality of life for pets with cancer. A cancer diagnosis for your beloved pet can be frightening. 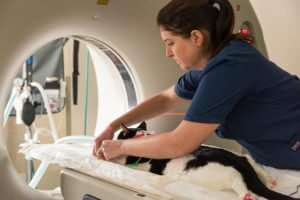 But veterinary specialists who treat cancer in pets – they’re called oncologists, just like in human medicine – want you to know there are more treatment options available now than in times past. 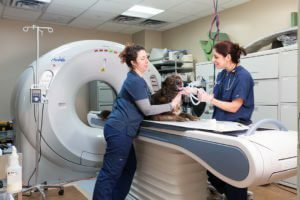 With years of advanced study and experience in treating pet cancers, veterinary oncologists say almost every pet can be helped to some degree. For some pets, that may mean a cure is possible. For other pets, there may be palliative treatments that provide an improved quality of life. Veterinary oncologists often work with other specialists at BluePearl. Because cancer symptoms can vary and may involve other conditions, many pets are diagnosed first by an internal medicine, surgery or other specialist and then are seen by the oncologist. 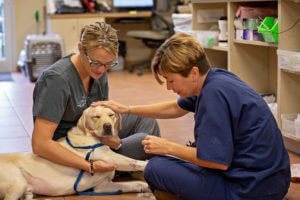 Veterinary oncologists use many of the same types of cancer treatments that are available in human medicine: surgery, chemotherapy and radiation therapy. Sometimes a treatment plan includes a combination of these methods. Oncology specialists work together with the primary care veterinarian and the pet parent to create a customized plan for each patient. The goal is always to improve quality of life, while minimizing unpleasant side effects. Radiation therapy works by killing rapidly dividing cells, such as cancer cells. A beam of X-rays or electrons, generated by a machine called a linear accelerator, is used to attack cancerous cells in a specific area. Highly trained and experienced doctors create a custom plan for each patient, including radiation dosage and number of treatments. Depending on your pet’s diagnosis, surgery may be done before or after the radiation treatment. Chemotherapy, if needed, may be given before, during or after radiation depending on the patient’s condition. When a cure or long-term tumor control is not possible, radiation therapy may be used to relieve symptoms and improve quality of life. Ask your veterinary oncologist if radiation therapy is available at your local BluePearl hospital.